The co-ed softball team Skittles will be taking the field tonight. This Wednesday there is Multicultural Food day. This is all at Porterville College. Experience the tastes of the world in one single trip. It's all free! Join us for a panel and discussion that will be devoted to youth LGBT issues. We welcome all youth, LGBT and straight allies as we do all ages all the time. GSA's (Gay Straight Alliance), Pride Clubs, and the Out Loud support group, please come and participate in this panel discussion to hear about the issues facing LGBT youth today and ways in which we can help them. We look forward to seeing all of you. Our youth is important.....they are our future! On Friday April 26th there will be two events geared toward the women of our community. Admission is free. Dinner and drinks optional. Dedicating countless hours volunteering for The Trevor Project has been more rewarding and insightful than I could have ever anticipated. Myself (Melissa) and other volunteers within the Central Valley help spread the message of The Trevor Project in various ways. Below is an example of one of the ways you can help contribute. Please read the flyer below for more information on how to become a Trevor Volunteer. The training usually happens once a year so get in while you can. Dates for training are scheduled for May 18th and 19th. This film will be showing two different nights in Porterville. Take advantage of the free screening followed by a panel dicussion afterward. Porterville College's very own Pride Club will be having a black light dance coming on April 19th! It's a Friday at 5 to 8:30 PM. There is a cover price of new toiletries or other items for donation to the women's shelter! Come out and support the women's shelter and have a fun night. We will be selling nachos, cookies, and water! Remember, this is a family affair, so dress appropriately! Bring your neon clothes and glowsticks! Want to make a difference? Sign up as a volunteer! Be sure to check out our community calendar. There is a large disconnect in our City as it pertains to the understanding and resources provided for LGBTQ people. We've been given an opportunity to make our voices heard. As part of the LGBTQ population I encourage you to take a few minutes to fill out the survey listed below. Panel Presentation About the T in LGBT! Zoyer, Jane, and Randy, from Fresno's Trans-e-motion, will be on the panel to educate about the transgender community, its umbrella, and what we should and need to know. They have a full program planned and expect us to participate in the conversation. There is a new lesbian meetup group formed in Porterville. They are looking to get together for potlucks, bowling, camping, fishing, and other various social activities. This is a great start for us in the community. I encourage you to get involved and get to know one another. Gay Fresno is proud to join with Marriage Equality USA (MEUSA) and 50 local and national partners in the Campaign for 20 Million More - a growing coalition working to win the freedom to marry and to defeat anti-equality ballot initiatives in Election 2012. "The Campaign for 20 Million More is a powerful example of what is best about our community and allies when we all work together towards big goals. I am so thankful to our almost 50 local and national partners for their contributions, and to the many MEUSA volunteers and staff for their work in managing this initiative," said Brian Silva, MEUSA Executive Director. "Over 20 million Americans will be affected by elections directly involving marriage equality in Maine, Maryland, Minnesota and Washington," added Stuart Gaffney, MEUSA Media Director. "Polls nationwide are showing majority support for equal marriage rights, and the Campaign for 20 Million More is now harnessing that tremendous grassroots support in order to win the freedom to marry." October 23rd 6pm - 8pm at Carrows, 4228 N. Blackstone Avenue. If possible please bring A) wifi-enabled laptop & headphones with/ mic OR B) wifi-enabled iPad and a cell phone. October 30th 6pm - 8pm at Denny's, 30 E. Herndon Avenue. If possible please bring A) wifi-enabled laptop & headphones with/ mic OR B) wifi-enabled iPad and a cell phone. The 20 Million More Campaign is a coalition effort supporting our marriage equality partners in Maine, Maryland, Minnesota and Washington as they face their own state battles this fall, by helping to educate the voters in those states regarding marriage equality. The campaign does this through phone banks organized across the country, and via canvassing weekends in the four election states. Full details of the campaign can be found at www.20MillionMore.org. October 11 was Coming Out Day. Many of us attended Coming Out events to celebrate. Many of us attended the same events to educate others who attended out of curiosity or desire to learn. We educated with the truth about the necessity of full equality for all and to make sure the second class citizen label goes away. We have a panel who will be telling their coming out stories so be sure to attend. Everyone has a story, and all stories are unique. If you have a special talent you would like to showcase at the event, let us know! Or if you want to sign up for any of the games. Vendor booths are still available. 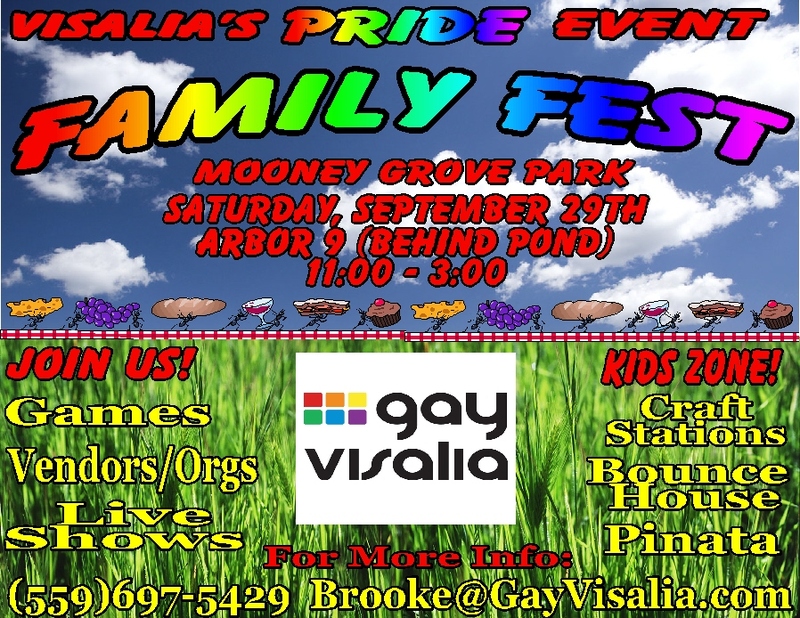 If you are interested or have any questions, contact Brooke@gayvisalia.com.